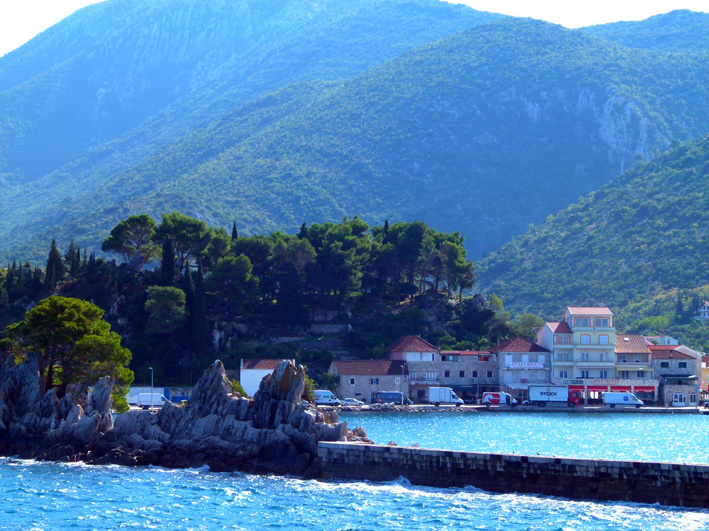 It was time to depart mainland Croatia and see what their famous islands had to offer. 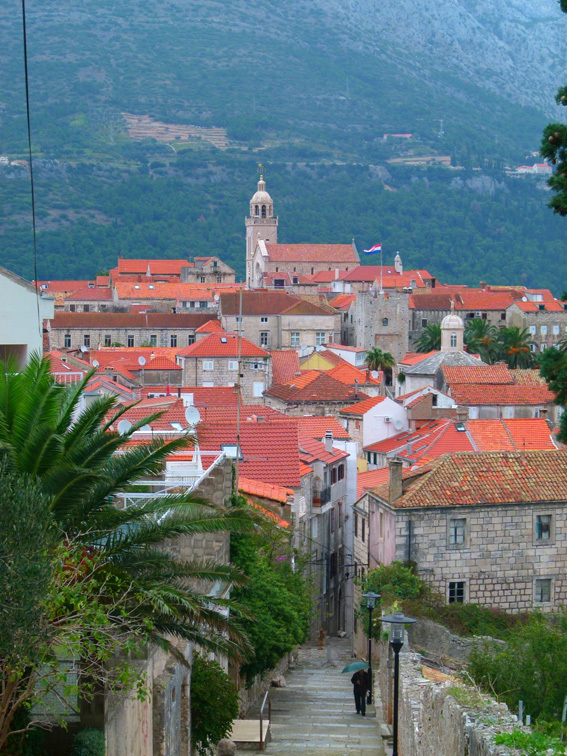 First up Korcula, then Hvar. Simply stunning. Worth every pedal stroke! And there were quite a lot. The ferry from Ploce to Trpanj. Entering the safe harbour of Trpanj. We will have to cycle over that hill. Our journey to the island of Korcula involved taking a car ferry from Ploce to Trpanj, a small village on a long spit of land jutting out into the Adriatic just above Dubrovnik. Fortunately, this late in the season, it wasn’t just a passenger ferry, as we were told they might not take bikes on board. 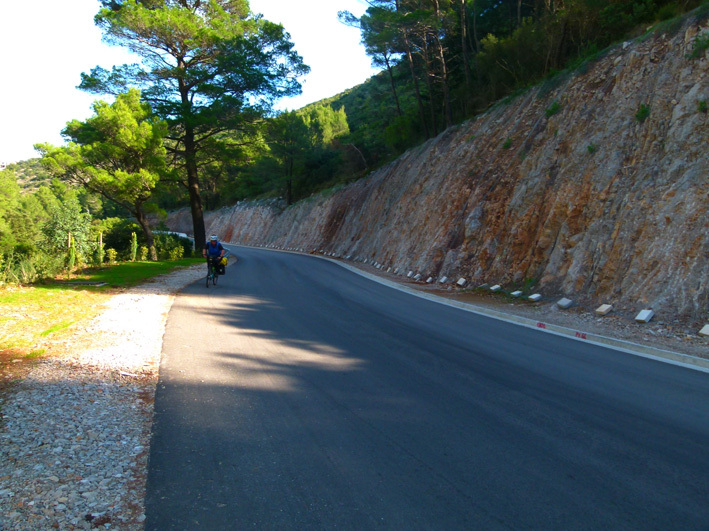 To get to Korcula, we would need to cycle up and over the mountains and down to the opposite coast to a place called Orebic, about 25kms away. Sharyn begins the haul up and over the mountain range. The road began to climb immediately on the other side of the village. We figured we needed to climb for about 11kms. The first 5kms were the steepest, after which we settled into a good rhythm, finally making it up to the main road on top of the range over an hour later. 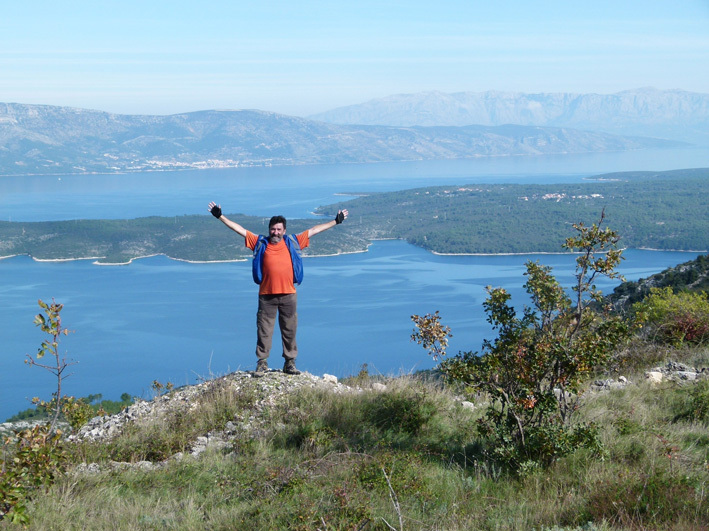 The final 12 or so kms to Orebic were a steady downhill run along the coast with fantastic views out to Korcula. The heady feeling of freedom gliding down a long slope, especially after a tough climb, is hard to match. It’s a real reward for all the effort and the thing that remains longest in your memory of the ride. Sharyn having a rest before the 12km downhill run into Orebic in the distance. We had lunch near the ferry port and then bought our tickets to Korcula. It takes just 20 minutes to cross over and we were soon cycling into the old town itself. Once again, we had to haul the bikes up flights of stairs at our Airbnb room, but it was worth it; we were right in the middle of the old city in a maze of cobbled laneways. The historic medieval town of Korcula from the ferry. 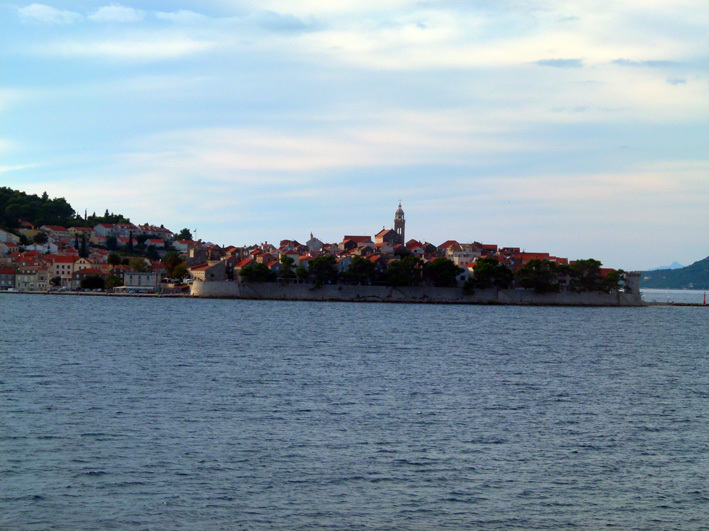 The Medieval town is World Heritage Listed and renowned for its intact fortified harbour. It also claims to be the birthplace of the world’s most famous traveller, Marco Polo (although Venice in Italy has something to say about that!). 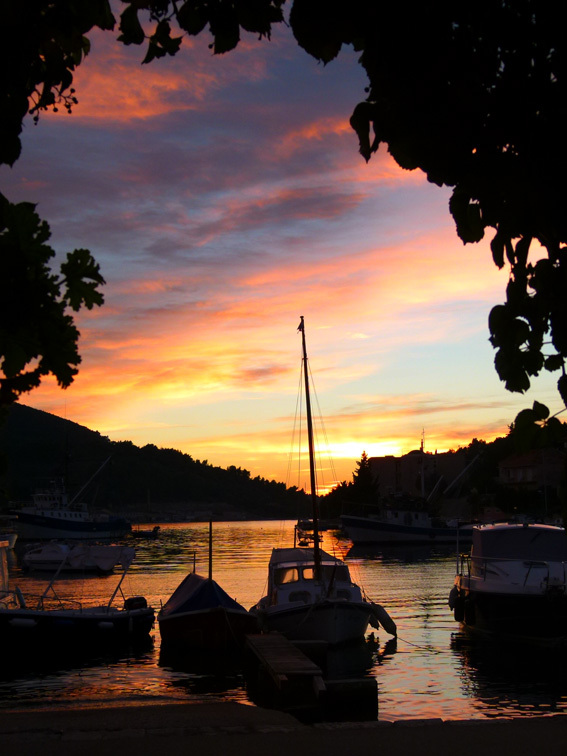 These facts alone make Korcula one of the most popular travel destinations, however, this time of year, we had the place to ourselves, especially at night once the now few daytrippers had departed. 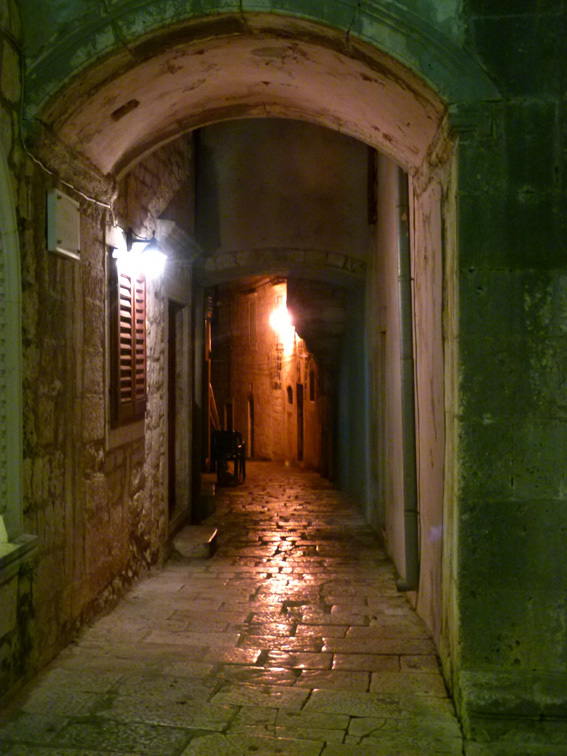 The narrow alleyways were empty at night after the tourists had gone home. 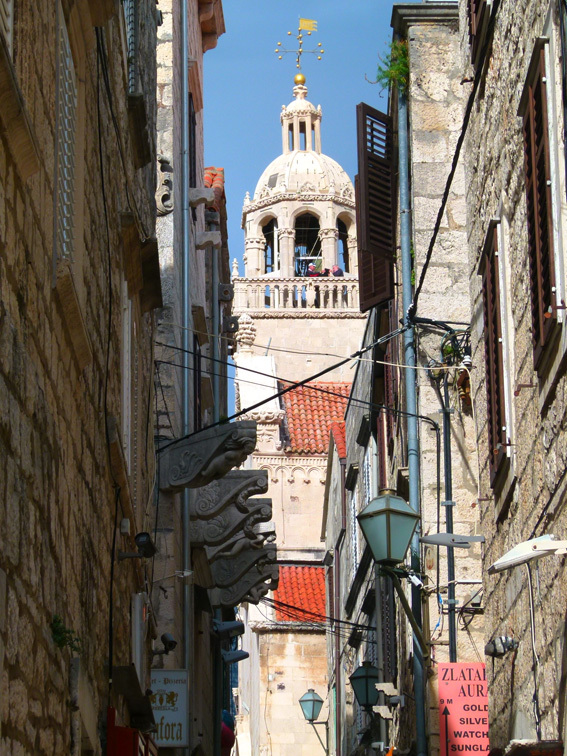 The steep stairway we’d have to negotiate to get out of Korcula. It takes little time to explore the town and its narrow alleys. All ways lead to a central plaza and the Cathedral of St.Mark. Nearly all of its red roof buildings are given over to tourist accommodations. Our only problem was working out the best way to get up out of town, as most of the town is perched on a huge hill rising straight up from the harbour. All lanes lead to the Cathedral of St. Mark in the central plaza. There was no easy way out, so we walked our fully-loaded bikes up 200m steps to a supermarket car park where we could take a short break. From there it was up again, a steep ascent to the top of the range that divided the island in two. We were huffing and puffing already and we’d only came about 4kms! It was still about another 33kms to Vela Luka (our destination) at the other end of the island. 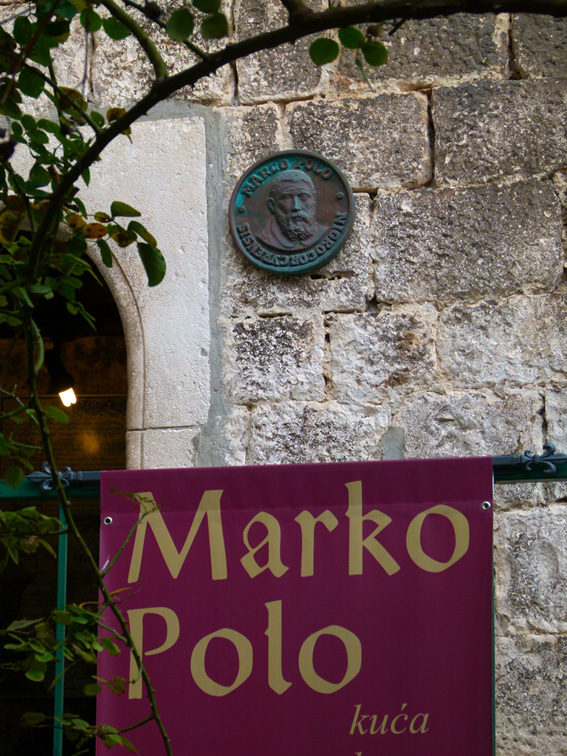 The birthplace of Marco Polo? At Pupnat (15kms), we turned off the main road to take the more spectacular coastal cliff road. This turned out to be one of the most scenic rides of our trip so far, riding along the cliffs and through pine forests with the turquoise waters of the Adriatic well below us. 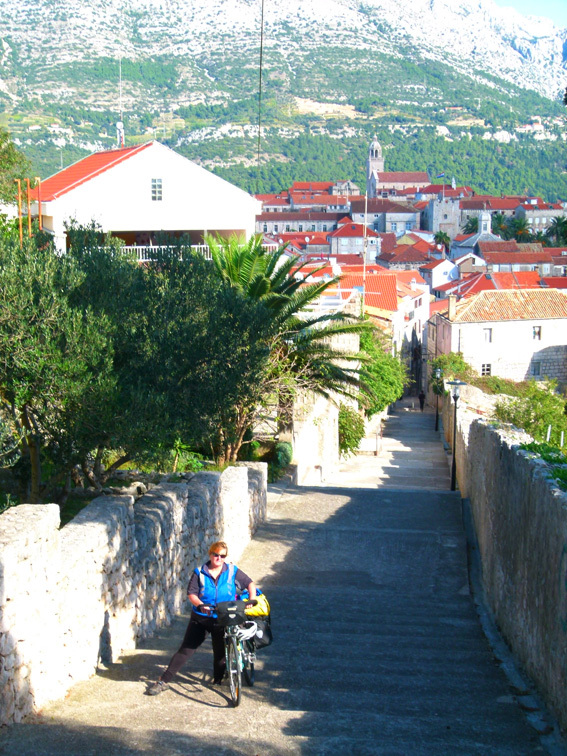 Sharyn lugging Sakura up the endless stairs leading us out of Korcula. The scenic coastal road was almost devoid of traffic. 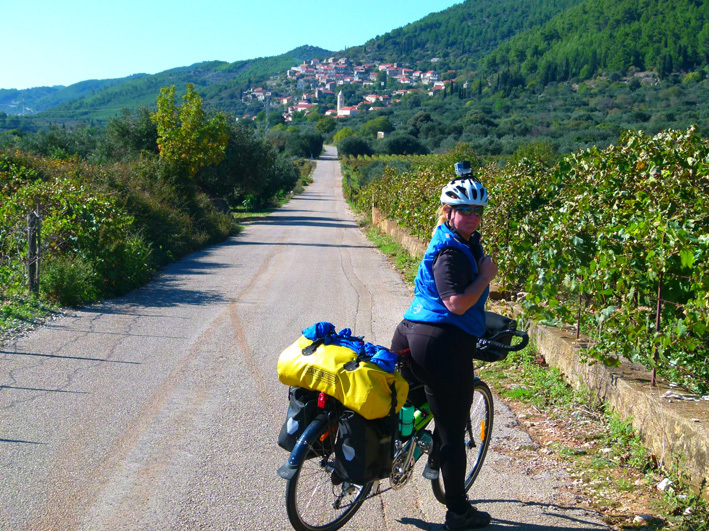 Sharyn stopping for a rest with the pretty village of Smokvica in the background. 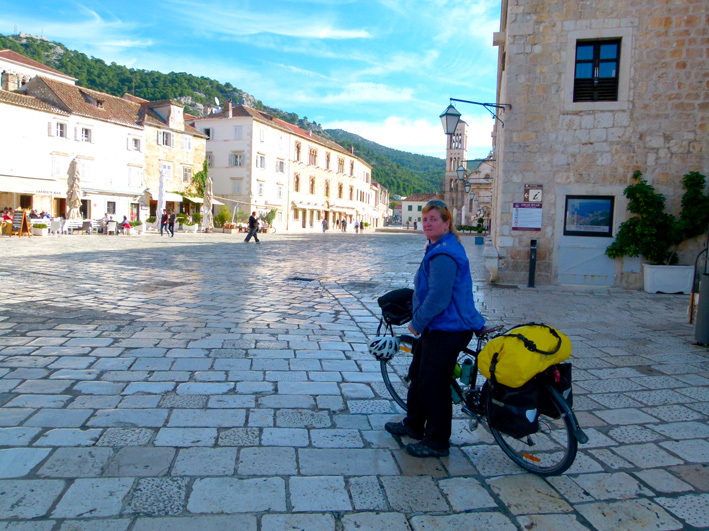 Sharyn riding through the main street of Smokvica. 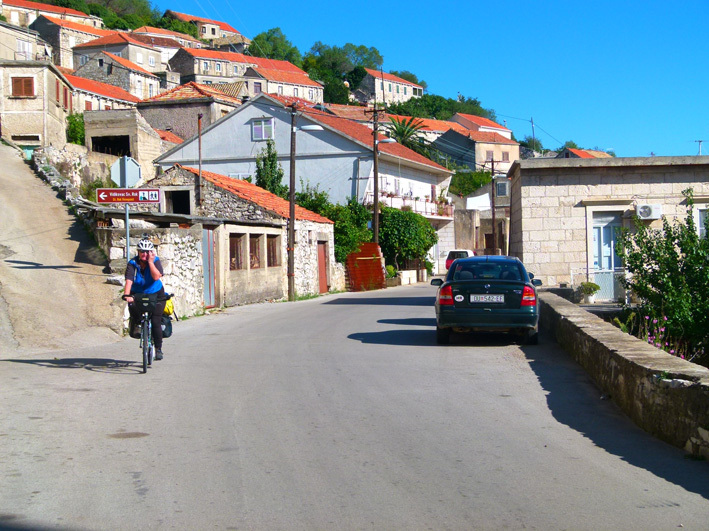 We continued cycling through the rustic village of Cara to the small town of Smokvica where we rested before attempting the sharp climb back up to the main road. Thankfully the remaining 15kms was comparatively flat. 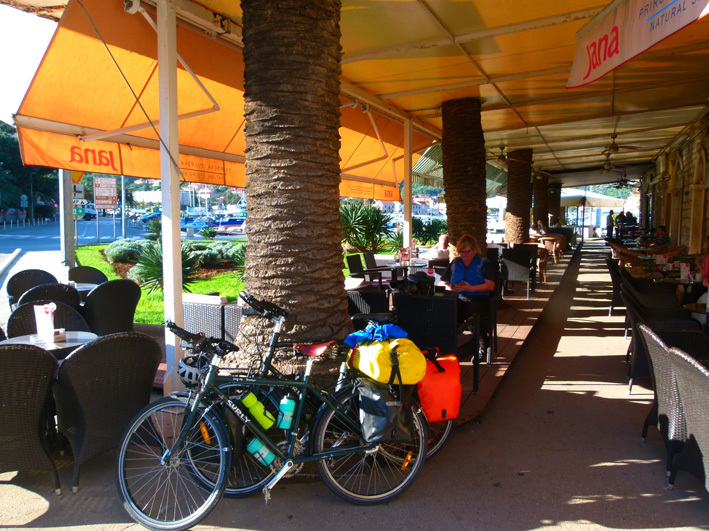 Resting in a waterfront cafe in Vela Luka after a wonderful day’s ride. 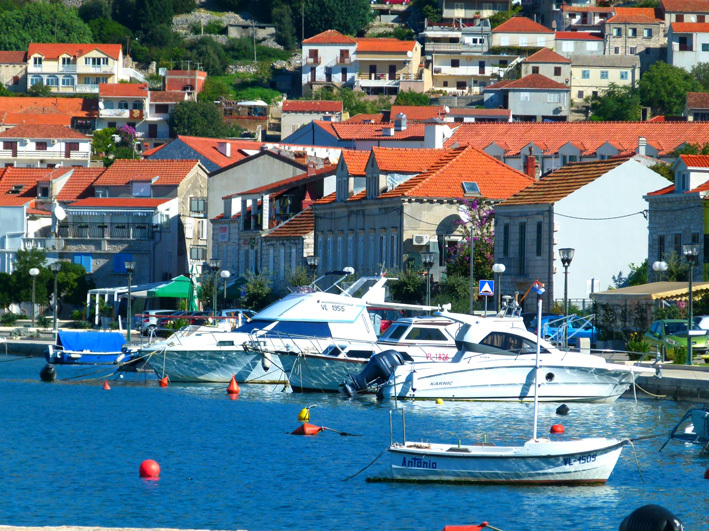 The quaint harbourside village of Vela Luka. 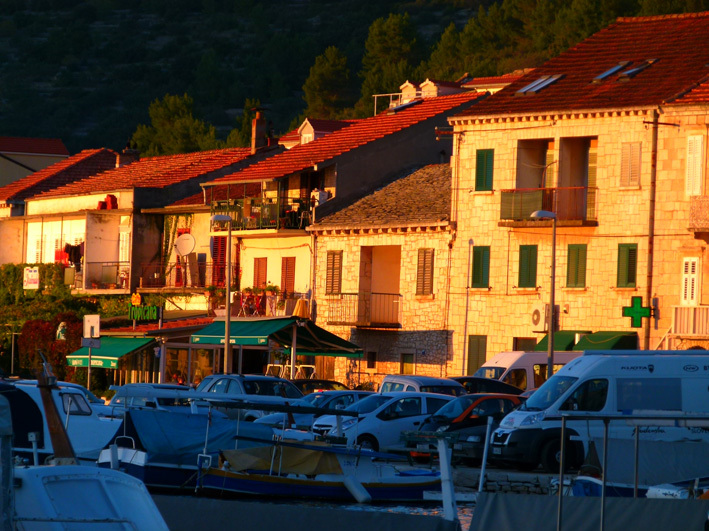 The pretty town of Vela Luka straddles a small bay with a ferry port at one end. The waterfront is lined with small restaurants with outside tables and colourful awnings. The small boats that make up the local fishing fleet bobbed up and down only metres away and the local cats lay about waiting for small offerings of fish from anyone willing to oblige. This is a great place to relax and we figured it may well be the perfect place to finish our ride as our time was running short to get back to Belgrade and then onto Budapest to catch our plane. Late afternoon sunshine in Vela Luka. Sun setting over the Vela Luka waterfront, great place for a beer at the end of the day. After a relaxing few days in Vela Luka we took our bikes down to the ferry. We’d checked the day before if we could take them onboard and were given the “OK”. This morning though was another story. As we pushed them up the gangplank and onto the ferry, one of the crew insisted we couldn’t take them. This ensured a Mexican Stand-Off as I refused to take my bike off and the departure time passed by. Tensions grew the longer it went, but I stood my ground and, eventually, they caved in. We tied down the bikes, gave on final “look of death” to our protagonist and went and found a seat inside. Arriving in Hvar Town. The main plaza runs down to the small harbour. Our destination, Hvar Town, on the island of Hvar, is a stunning little harbour town lined with expensive yachts and overlooked by a medieval fortress. The hills which rise up from the waterfront are covered in pine forests and olive groves. Sharyn searching online for accommodation while we have a coffee and something to eat. We went straight to a cafe near the small marina plaza and began searching for somewhere to stay. It didn’t take too long and we found a place about 5 minutes ride back around the harbour and halfway up a hill with a fantastic view of the town and waterfront. We had landed on our feet once again, despite the bad start to the day. If the guy on the ferry could see us now, he’d choke! It was a nice thought! 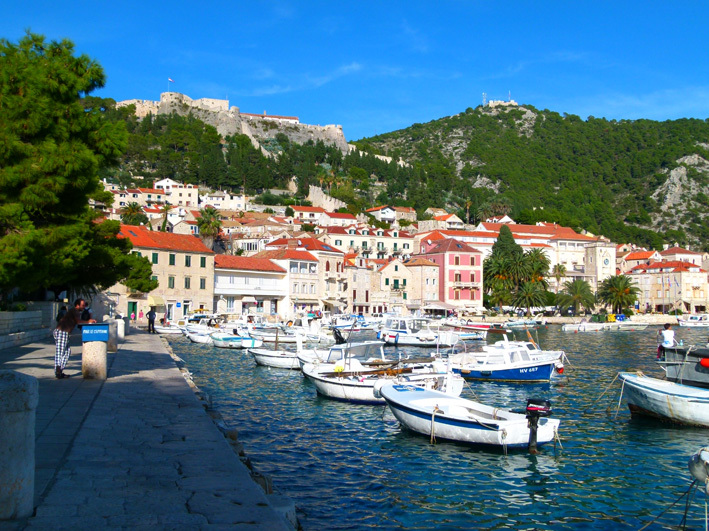 Picturesque Hvar Town with its imposing castle perched directly overhead. 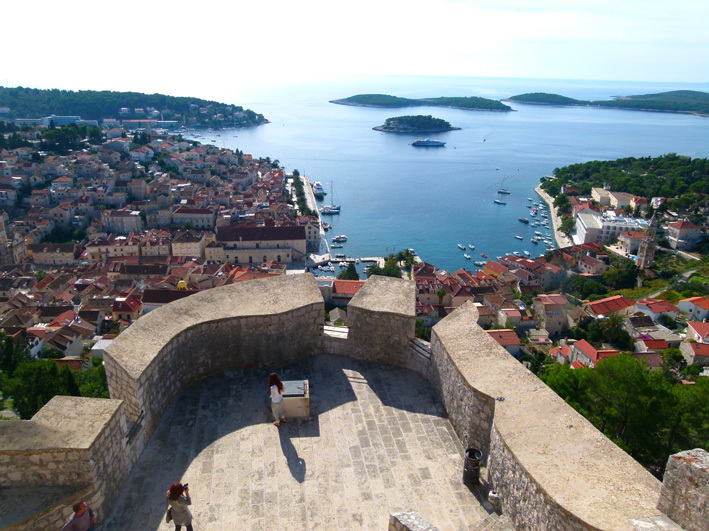 We remained in Hvar for a few days exploring the fortress and the surrounding coastline. Lots of day trippers come over from Split during the day, but, once again, at night the place was very quiet. Hvar Town from the battlements of the old fortress. 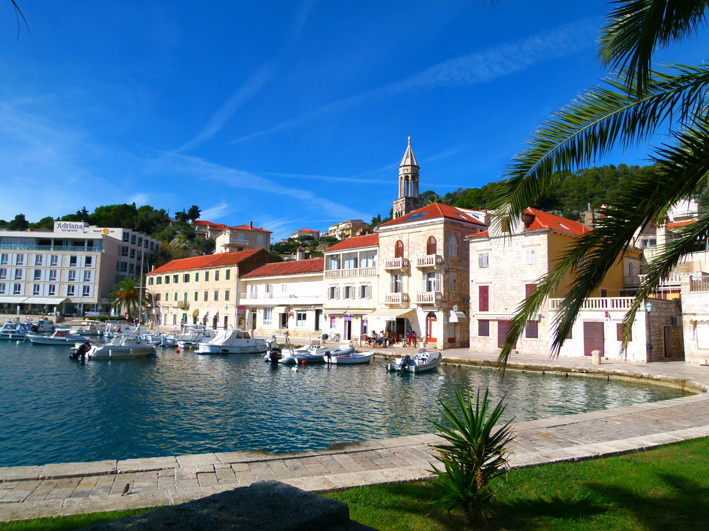 Hvar Town waterfront, a great place for a stroll and some people-watching. 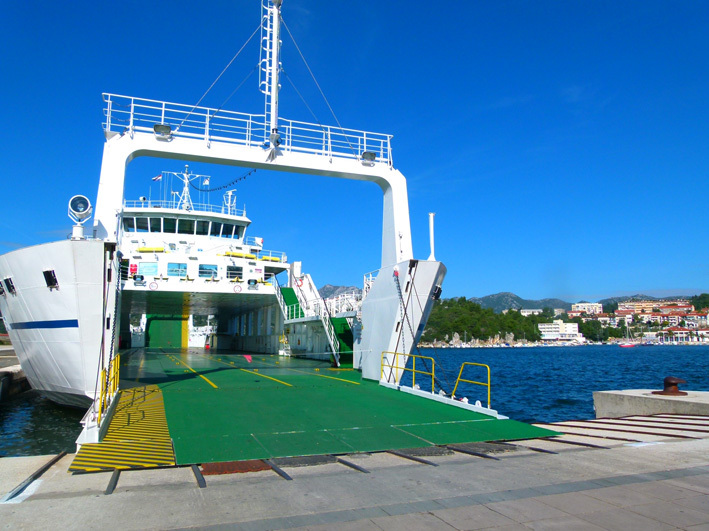 Our research revealed that we needed to go to Stari Grad to take the ferry to Split, it was the only car ferry to Hvar Island, so we’d need to do one last ride. The main road went up through a long car tunnel which we judged too dangerous, so we elected to take a small country road up over the mountain instead. The long, steady climb to the mountain-top village of Busje was one of the most gruelling legs of our trip so far. The irony that it was also our last leg was not lost on us! We were absolutely shattered by the time we reached Brusje, but there was still some climbing to do, albeit not as steep. As we passed over the top, we stopped and refuelled on a grassy patch of ground with fantastic views over to Split somewhere along the distant coast. After struggling to the top of the Hvar mountain range, a good long break was in order to refuel and take in the view. 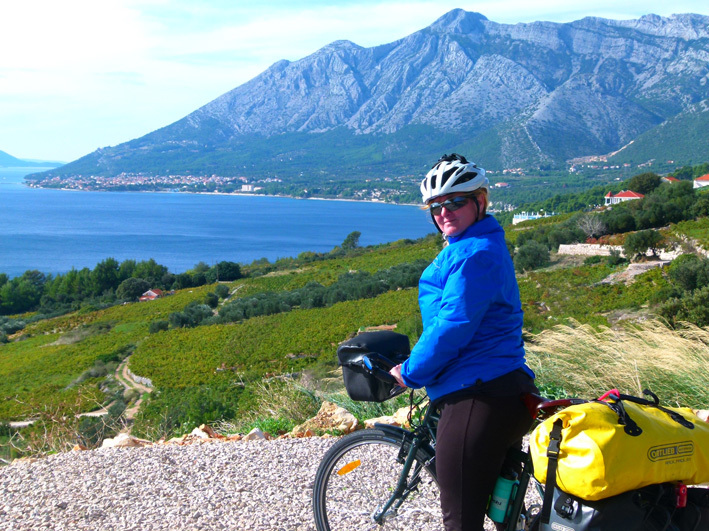 The ride down to Stari Grad on the old road was something of a white-knuckle death ride. A brake failure going down here could easily be fatal. We took our time and stopped to enjoy the views and let some traffic get past us. By the time we reached Stari Grad (Croatia’s oldest city), we realised we were still in time to make the last ferry to Split. The ferry terminal was about 5kms out of town, and, it was either that or ride down into town then back again early tomorrow morning. By now Split sounded very good, so we rode down to the ferry, bought some tickets and waited with a coffee for our ride to show up. Sharyn used the internet to book a room while we waited. We had finished the last leg on the bikes, about 2,500kms. From now on it would be on trains to get our way to Budapest via Zagreb and Belgrade. We had not cycled as far as we had imagined, but we were quite happy with what we’d seen and we’d met a number of really nice people along the way. 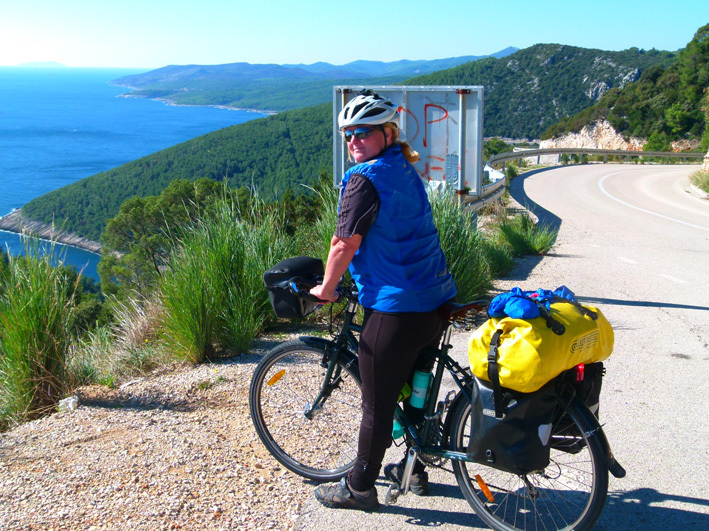 Our European bicycle tour was yet another fantastic addition to our growing list of transcontinental adventures. Is this not one of the most beautiful places in the world? Let us know what you think in the comments below and please share freely to those you think might be interested in hearing our story.